Real Food. Real Nutrition advice. do I feel any different? have my energy levels changed? is the paleo way of eating difficult? do I enjoy the food? It is probably too early in the piece to notice major change, but I do feel like I have more energy, am generally satisfied between meals, and have had less cravings for sweet foods (I say less not none). I am really enjoying the food that I have been eating, and experimenting with new recipes from all the great paleo resources out there has given me the chance to break out of the ‘same dinners every week’ rut. 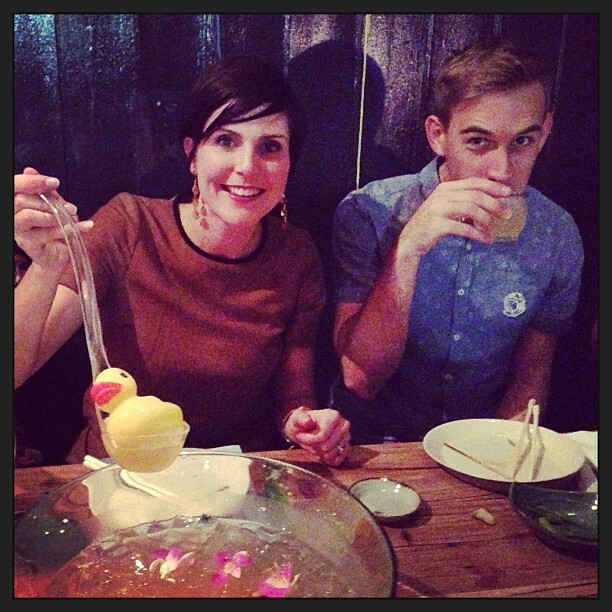 Enjoying punch on my bday… to be avoided this weekend! The food I have been eating has been so yummy that the Whole30 has been easy to follow, however as I was ill last week I did by default avoid most social occasions. This weekend we have plans for a dinner cooked by a chef friend, which I know will involve butter, sugar, and other no-go foods – not sure how to tackle that one yet. I am also heading out to a friends’ gig, where usually I would watch with beer or bubbles in hand…. not this weekend! Eeep wish me luck, I will need strength to pass on the beer. Today I ate lots of leftovers from weekend cook-ups – tasty and easy, love it! Previous Post Whole30 – Day 7: Coffee Expo! Next Post Whole30 – Day 9: Biggest Loser!